Colorimetric is the study of the number value of each color as nature brings to humans as we know now a day. Also there is a code number from PANTONE that gives the specific color to search it on the wide world of colors. The colors come from nature but humans could understand that there is a rule on nature so that could represent a circle of twelve colors. PRIMARY: there are three; red, yellow, and blue. SECONDARY: the mixed of two of them. If you put together on a line primary and secondary by joined the complementary each by each color you have six colors. TERCIARY: there are six and there produce by mixed of the primary with secondary colors. If you put next one color with other analog then you have the chromatic circle. (brainstorming) used chromatic circle. Designers focus on the colorimetric as the first step to develop the whole collection. This circle of twelve colors is study by designers. The opposite colors at the circle are complementary. 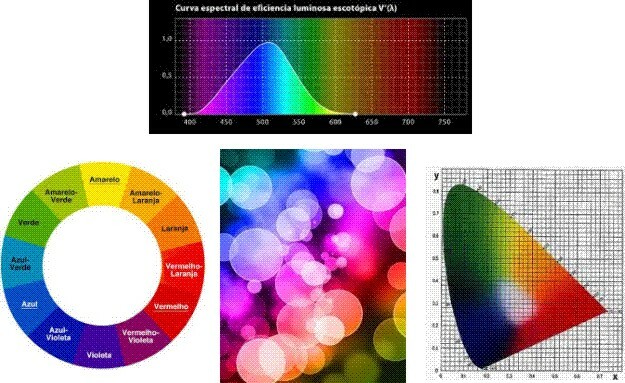 Hue is the place that a color have on the chromatic circle. The color that is next to other are analogs. Artists and designers used also the color white to get clarify the tone. Also to do the opposite, they mixed with black color to get dark of a tone. Tone is a word that means a color was clarify or the opposite that is to grow dark. More over this chromatic circle helps the artist working as an assistant. Then the artist or the designer could create the wide world of color. The colors will define the season that is looking for. A collection needs a searched ideas. As I said before the designers began their research focus on a color or colors of this colorimetric. They search all type of words which represent that color or colors to create by this way a lot of information that could help the designer to get all the ideas that will need for the collection of the garment that’s began to create. Designers must think over the original source of colors which was the inspiration that began the whole research. Those colors define the spirit of the collection. Besides the color, there is also something like the brightness, saturation, tridimensional, and much more knowledge that helps to produce that huge variety of stamped fabric creations. will provide a bigger and bigger symphony of colors that people can used on their garments. So what’s next ? Thanks a lot for your comments. I wrote this article about colorimetric because is the first step for create the atmosphere which inspired at the time of create garments.